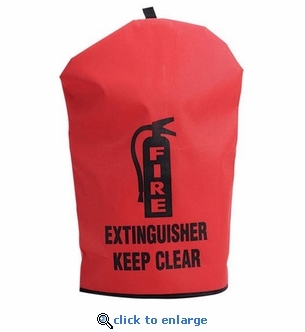 This Medium fire extinguisher cover is 25" H x 16.5" W, and made of acrylic coated polyester with hook-and-loop closures for the harshest conditions. Fire extinguishers that have the potential to be exposed to the environmental conditions need to be protected. Covers are red with contrasting black lettering to be easily identified in the event of a fire emergency. BE-FEC10 X-Small 18.5" x 7"
BE-FEC7 Small 20" x 11.5"
BE-FEC8 Medium 25" x 16.5"
BE-FEC9 Large 31" x 16.5"